Our extended and refurbished “malecón” has brought about results one can spot at first sight. The appearance of downtown Puerto Vallarta has changed and, though it brings nostalgic sighs to some, most agree that its new look is equally captivating. 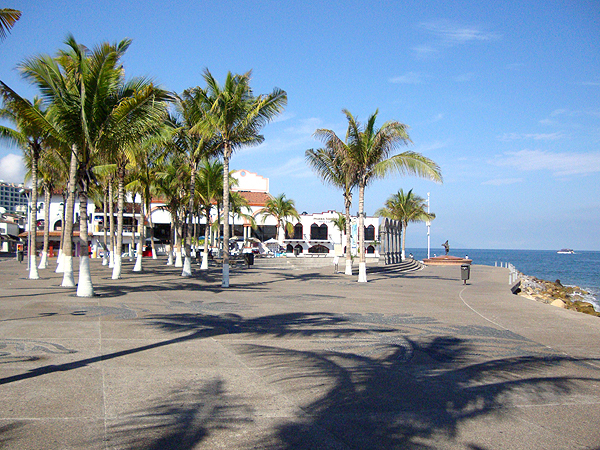 The fact is that our “malecón” continues to be the most popular and familiar walk to see and be seen. Standing out among its widened walkways are the works that have made it Mexico’s most original, public open air sculptural museum. According to some sources, its original construction dates back to 1926, after a hurricane of similar intensity to that of recent “Kenna”, though the former had had enough power to, among other sequels, open a second bed to the mouth of the Cuale River, forming what we know today as the Cuale River Island. Back then, Colonel Ocampo ―chief of the local military base―, ordered the construction of a breakwater that preceded our new, wide, versatile and picturesque boardwalk, bordered by 31 de Octubre street on the north and Parque Lázaro Cárdenas on the south. As time went by our “malecón” was decorated by various works from prestigious sculptors and presently displays an enviable collection of sculptures of priceless artistic, historic and cultural value. Starting our tour from north to south ―located beside the old port’s dock, next to Hotel Rosita― the first sculpture to be admired is monumental. It was named “Los Milenios”, by author Mathis Lídice. Made from bronze on a steel structure. Its spiral base evokes the theory of evolution of life originating in the ocean. Its main characters are Charlemagne, the Aztec Emperor Nezahualcóyotl and a young woman with a dove in her hands. These three characters represent three millennia of the Christian Era: two gone by and one beginning. This piece was donated by the author with the collaboration of several local enterprises and individuals and inaugurated on October 31, 2001. 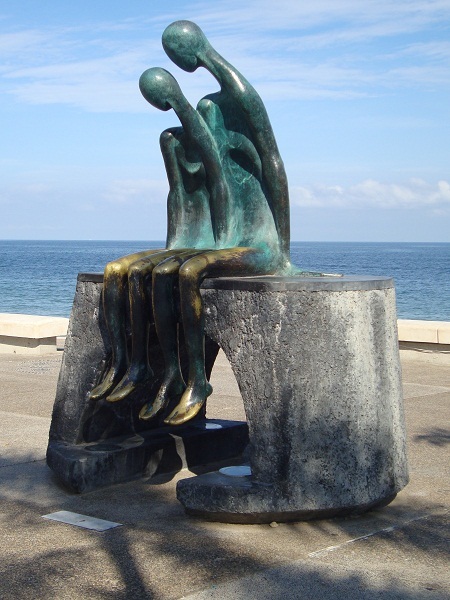 Once on the “malecón”, tourists will find “Origen y Destino”, from painter and sculptor Pedro Tello. It is composed of a group of sculptures that refer to the comings and goings of man as a thinking entity. It is formed by The Canoe, standing for the invention of navigation and a symbol of mobility and creativity, and always subject to nature’s conditions. The Horse, standing for indomitable time that never stops its course along which man transforms his environment and himself. The Chimera, evokes imagination promoting dreams coming true. The Calf-Whale, The Musician, and The Ballerina (the last two still absent), represent the celebration of the new millennium. The Wheel represents mankind and its dependency on technology. The Obelisk, shows the creative strength of man over nature, space and construction technology. We walk a few steps further to face “Nostalgia”, the most romantic icon in our port, created by Ramiz Barquet. It was inaugurated on May 31st, 1984, promoted by his wife, Mrs. Nelly Galván de Barquet and sponsored by the Patronato Pro-Arte de Puerto Vallarta, AC. The piece represents mainly the oceanside love story between the author and his wife, with which many couples around the world identify. A few steps further and we are in front of “The Subtle Pebble Eater”, a quite intriguing work by the Jalisco sculptor Jonás Gutiérrez. A metaphor on human condition; the pebbles representing the negative emotions a man takes in in his daily life, many of which harm him and make him grieve. It is through the “Unicornio de La Buena Suerte” that we find a new artistic perspective. This bronze piece, inaugurated on December 2010, represents our city’s good luck, according to mythology luck accompanies unicorns. Its author is Anibal Riebeling. Now “Neptuno y Nereida” appear onstage, a very special group sculpture which in fact was the official identity of the southern Jalisco coastline known as Costa Alegre. It was inaugurated during 1990 and its author is Carlos Espino. Time has come for “La Rotonda de Mar”, definitely the most shocking sculptural assembly. The work joins strange hybrid characters with both marine and terrestrial, human and animal features, assembled to confer at the “malecón” over themes we willl never know about in a language not understandable by us. It was inaugurated on December 30, 1996, its author is Alejandro Colunga and it is hard to hold back from interacting with its characters. Time to climb!… That is what this sculpture seems to be calling out to all passersby. Sergio Bustamante created a group of fantastic pieces, inspired by the words of English philosopher Bertrand Russell: “With reason man is more just in his contemplation of the world”. This piece is considered odd and disquieting by many. It was installed here on 1999 celebrating the beginning of the festivities of the third millennium in the city, generating much controversy due to its theme, location and shape. It is presently one of the favorites among locals and visitors. “El Caballito” merrily rides at its new location prepared especially for it. This work from master sculptor Rafael Zamarripa is definitely the most photographed emblem of our port city. The piece was originally placed at Los Muertos Beach and was lost for a long period when it was sent out to be repaired. The author was again commissioned to make the one located a few steps from the amphitheater. It was inaugurated during 1976. The original “El Caballito” was eventually recovered and replaced at the edge of Los Muertos Beach. The gate to the heart of our Port is the structure called “Los Arcos”. The silent and loyal stage to a great variety of international art forms. The original structure was brought in from an estate in Guadalajara and was torn down by hurricane “Kenna”. The present structure is a replica; at its feet, the amphitheater Aquiles Serdán, continues to be the site of the most significant historic, cultural and touristic events of our destination. It is the beautiful sculpture-fountain that framing our amphitheater, dividing the pedestrian zone between the extended “malecón” and the ocean. It was inaugurated by the Patronato Pro-Arte de Puerto Vallarta A.C. and donated by the Comité de Ciudades Hermanas Santa Barbara-Puerto Vallarta (Santa Barbara-Puerto Vallarta Sister Cities Commitee) while the City Hall also collaborated in its construction. This fountain, whose original design was created by architect Gilbert García, supports the spectacular bronze piece named “La Danza de Los Delfines” (Dolphins’ Dance), it is also an emblematic piece of our city, created by the American artist James “Bud” Bottoms. A beautiful legend underlies the creation of this sculpture; we will share it with you on our deeper exploration of this subject in a forthcoming article. Though not a sculpture, it is an upbeat and masterly work of art we cannot avoid mentioning. While we face the sea we are confronted by a beautiful mural created with tiles from a painting named: “Vendedores de Pescado”, an original from Puerto Vallarta’s painter-ambassador Manuel Lepe. The scene honors the very popular vendors of fish cooked over charcoal on the beach sand. The mural was placed here within the period 2010-2012, the original painting was created by Manuel Lepe in 1981. Very much in line with the dancing dolphins, further on we will find the “Bailarines de Vallarta”, a colorful and vibrant piece created and donated by sculptor Jim Dimetro, inspired by the youthful participants of Vallarta’s “Ballet Xiutla”, proud cultural and artistic ambassadors of Puerto Vallarta to hundreds of venues around the world. The “Erizados” are two iron sculptures making an amiable contrast among the rest. Their author and donor is Maritza Vázquez. It was inaugurated on May 19, 2007. Its special composition and shape makes a very unique visual effect of the horizon as seen through it. Photographing the sunset through the “Erizados” is a great idea for those who love to catch unique and spectacular views. 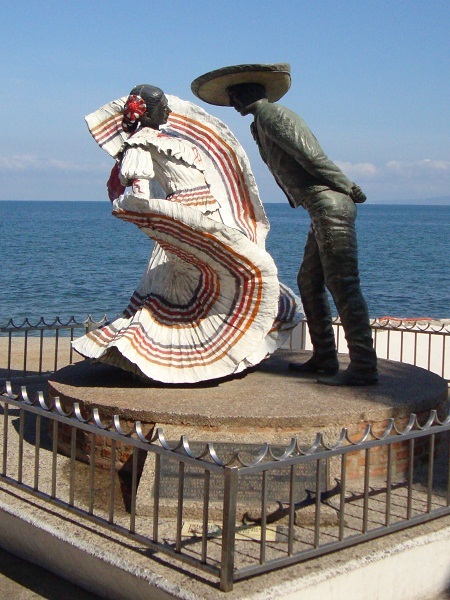 Puerto Vallarta has long been recognized as an international gourmet destination, for that reason, a sculpture of a noble figure could not be left behind. Created with the purpose of honoring “San Pascual Bailón”, considered to be the catholic patron saint of cooks and bakers. It is located a few steps from the “Erizados” and it was also created by sculptor Ramiz Barquet. Just steps away from the pedestrian bridge that joins the extended malecón and Los Muertos Beach, inaugurated on December 2012, we meet the bronze sculpture of Mexican professional golfer Lorena Ochoa. She has been named Touristic Ambassador of the State of Jalisco. Having crossed the pedestrian bridge over the Cuale River and its Island, after a short walk we discover the “Señora Lavando”, representing ―besides the women that do their washing in the river―, a beautiful era when people could just sit and watch the days pass by unhurriedly. There is a space between the sculptures “En Busca de La Razón” and “El Caballito”, just on the rim of the street bordering the widest part of the malecón ―although a totally different structure ― you will find a very distinct historic monument identified as “El Faro”. 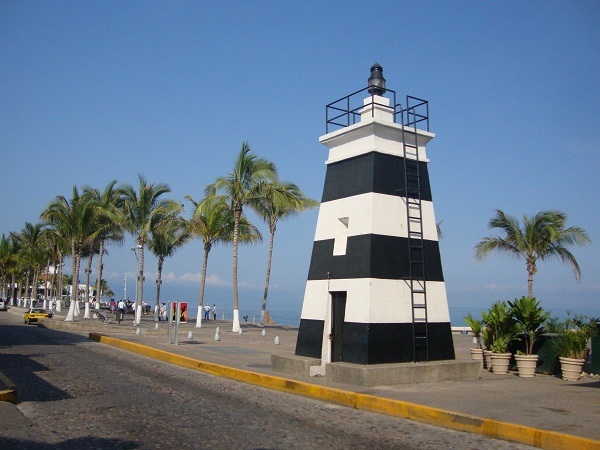 It is a beacon that operated between 1930 and 1970 assisting the navigation of vessels that anchored at the Estero de El Salado maritime terminal. This is the oldest and best preserved structure on the malecón and it is not just a city emblem, but also one deeply felt in the heart of Vallartans because of its both humble and brilliant fishing activity origin. 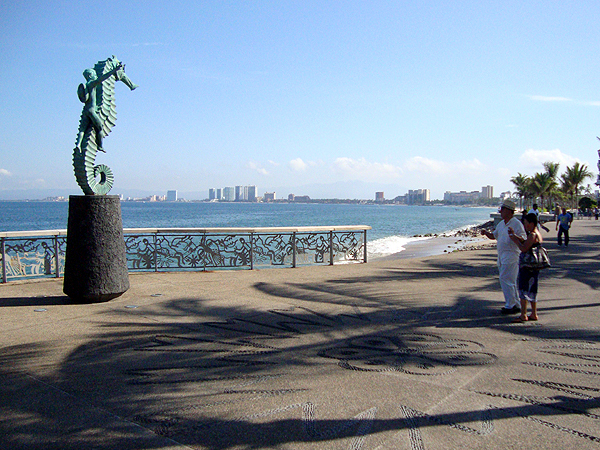 Such is the sculptural tour of the new malecón in Puerto Vallarta, naturally decorated by slim and elegant palm trees, luxuriant bougainvilleas, terraced almond trees and a great diversity of plants and flowers in large, undulating planters that add to its beauty and amplitude. It is really worth the while to explore the malecón in detail ―we shall continue to do so, so that in a future article―, we will share with you our discoveries on its history, planning, construction, renovations and more. Please take into account that we are describing this tour from north to south starting at the Hotel Rosita, the oldest operating hotel in town ―founded in 1948―, a landmark of downtown Puerto Vallarta, considered an historic building, located on Paseo Díaz Ordaz No. 901, between the streets of 31 de Octubre and Jesús Langarica. Featuring over one hundred comfortable rooms, the Hotel Rosita with its hacienda style is the ideal hotel for those looking for intimacy, great location and warm service at a fair price. Let’s continue exploring and staying in contact!